zip lining, stand-up paddle-boarding, horseback riding, and rock climbing, as well as a mud obstacle course, driving ATVs, and playing paintball. I’d only ever been whitewater rafting with my parents in the Pocono Mountains of Pennsylvania as a teenager, but I had convinced my family it would be fun to take some risks outdoors. 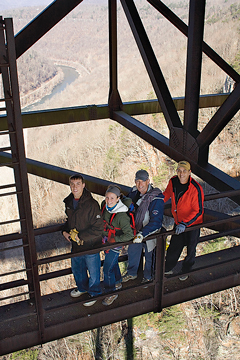 As we slithered our way down a steep slope, driving a winding road literally through the middle of the former coal mining town of Minden, West Virginia, we all wondered aloud if this was maybe more adventure than we could handle. But then my kids laid their eyes on all the inflatables at ACE Lake, reminiscent of the television show, Wipeout, and they predicted it would be one of our best vacations yet. Since the scenic drive from Richmond due west took us four-and-a-half hours, we stayed three nights so we could have two full days of outdoor fun. The first day, we went on the beginner-friendly whitewater rafting trip on the upper New River. Setting out early, it was a full-day activity with Class I to III rapids and a break for a delicious hot-grilled riverside lunch (vegetarian friendly). We even stopped a few times so folks could jump off rocks and swim in some of the calmer stretches of water. We had two boating options – the traditional team raft or the ducky, which is a cross between an inflatable kayak and a canoe. We opted for double duckies. This way my husband and I could each paddle with a child. The canyon setting was magnificent, and it was easy to paddle in the pools. I’m not much of a daredevil so I’ll admit being in command of my own boat through Class III rapids was a bit nerve-racking, especially after hearing all the worst-case scenarios prior to our departure, but my kids, of course, thought it was all very thrilling. a bit more extreme, look no further. My favorite activity was the half-day mountain lake kayaking tour. On our second day, we traveled by bus to Summersville Lake. The other family on board shared tales from the fantastic time they had on the ACE zip-line tour (grandma included) and their plans to go rappelling later in the week. On our way to the lake, we drove over the New River Gorge Bridge. We passed brave souls traversing the catwalk of what was for a long time, the longest single-arch bridge in the western hemisphere. It’s also one of the highest vehicular bridges in the world. It’s 850 feet above the river and 3,030 feet long, so chances are, walking along the underbelly of this bridge is unlike anything you’ve done before. Being driven over it was enough for me. Once at Summersville Lake, we took in the scenery from our own watercraft. This reservoir is formed by a rock-fill dam and is the largest lake in West Virginia, spanning 2,700 acres with sixty miles of shoreline in summer. The rock cliffs of this setting were absolutely breathtaking. After learning some basic strokes and proper techniques for our kayaking excursion, we explored a portion of the shoreline. We stopped periodically to paddle under waterfalls and into caves as well as jump off of cliffs. My older daughter chose to try deep-water solo rock climbing, which proved quite a feat and made for a truly memorable morning. We spent the rest of our visit at ACE’s Adventure Park and Lake. It’s five acres of entertainment right in the center of the resort. My kids had been talking about the inflatables and other toys on the lake since we arrived, but my husband would soon be equally impressed. They climbed the 15-foot glacier, bounced on water trampolines, and walked (or tried to walk) the planks. They strapped themselves into the Euro-bungy, which ACE calls a trampoline on steroids, and harnessed themselves into the zip-line over the lake. By the time the day wrapped, we were all so tired we could barely keep our eyes open through dinner. It’s really no wonder some 40,000 visitors a year travel here. The guides are knowledgeable and the staff is friendly. ACE opened thirty-five years ago and has since grown to become the largest outdoor adventure resort in North America for good reason. While Frisbee golf is the only activity that’s free, the resort does offer a variety of accommodations so families traveling on a budget can make the most of their money. You can camp for as little as eleven bucks a night. We stayed in a semi-rustic cedar cabin, which means we had AC/heat, electricity, but no television or bathroom. Our cabin was adorable and like new, even though it was nearly six years old. It was one of ten in a cluster that shared a shower house with five private bathrooms and a larger men’s facility. But if the idea of going without creature comforts is not your idea of a vacation, then look into the one-bedroom and two-bedroom cabins with bathrooms (and in some cases hot tubs) as well as deluxe accommodations, including a 5-bedroom lodge. The possibilities are plentiful. Our cabin had an outdoor grill and a kitchenette, but there’s also a restaurant that offers a meal-plan option for people like me who don’t equate cooking and recipes with relaxation. We grabbed brick oven pizzas at the patio grill at lunchtime and dined at Woody’s Lakeside Smokehouse, which served delicious breakfast and dinner buffets. Thanks to my mom, I grew up listening to John Denver and I knew all the words to his songs, even though I was a Jersey Girl. On our drive back home to Richmond, I found myself singing, “West Virginia, Mountain Mama, take me home country roads,” and daydreaming of when we’ll return. 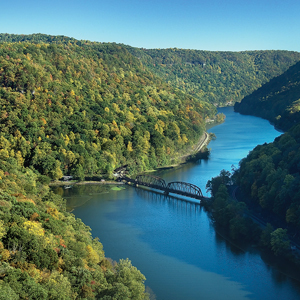 I have no doubt that if you like wild and wonderful, you’ll feel at home with your family in West Virginia, too. We Need to Get Outdoors! Ultimately, Louv argues that parents’ best intentions are often our biggest hurdles when it comes to kids spending more time outdoors. “Fear is the most potent force that prevents parents from allowing their children the freedom they themselves enjoyed when they were young…fear of traffic, of crime, of stranger-danger and of nature itself.” While Louv does an excellent job of proving that the generalized social anxiety over our fears is unwarranted, outdoor adventures, like the ones at ACE Adventure Resort, offer families the perfect compromise. As far as Louv is concerned, playing outside isn’t simply leisure time: “It’s an essential investment in our kids’ health.” Nature presents us “with something so much greater than [we] are” and that reality far outweighs any fears holding us back. 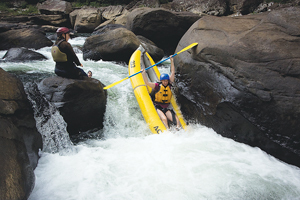 When I navigated the upper New River in West Virginia – cheering as my kids jumped off rocks and smiling as we tackled the rapids, I knew Louv was right. Experiencing nature together can be hard to do because, as Last Child in the Woods points out, “Parents must walk a fine line between presenting and pushing their kids to the outdoors.” So Louv suggests you start small and offers the old Native American saying: It’s better to know one mountain than to climb many. I think the key to raising outdoor enthusiasts is doing something you enjoy; that way the passion will be contagious. 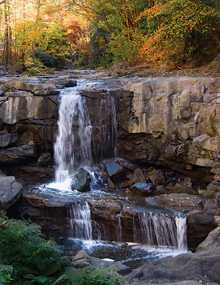 When you can get a world of adventure in one place, like visiting ACE in West Virginia or even rock-hopping on the James – why not jump in and see where the river takes you?